In Bang! each player takes on a character and a role in a Wild West shootout. Depending on which role a player is given, he has a different agenda for how to win the game. If you are the Sheriff, you must kill the Outlaws and Renegade. If you are an Outlaw, you must kill the Sheriff. If you are the Renegade, you must be the last man standing, and if you are the Deputy, you win if the Sheriff wins. Each turn, you draw two cards, play whatever cards you want (but only one "Bang!" which shoots at an opponent), and then discard extra cards if you have more cards in your hand than hitpoints left on your character. Once the Sheriff is killed (or has killed all the Outlaws and the Renegade), the game is over - whoever has met their victory condition wins the game. The first thing that I like about Bang! is the "secret" roles. I put secret in quotes because the secrecy of it may or may not last very long - often you will be able to determine what role each player has within the first few rounds. However, even if the players are pretty sure that they know what role each player has, it is still a fun element that the players have different win conditions. One way that the roles add to the fun of the game is in forging an unlikely alliance between the Renegade and the Sheriff - since the Renegade has to be the last man standing, he has to kill all the Outlaws before trying to kill the Sheriff. If the Sheriff dies too early, the Renegade loses. Another aspect of Bang! that I like is the "distance" aspect of the game. In Bang, each player can only target the player on his right and his left, because they are at a "distance" of 1 (and that is as far as their gun can shoot). There are different ways of increasing this distance including extra guns, horses, etc. Either way, this element of the game can effect the outcome because not all players can target each other. If the Sheriff winds up being surrounded by the Deputy and the Renegade, then the Outlaws are unable to shoot at him to start the game. This helps the game last a little longer with more back-biting among the players, and isn't that what everyone wants in a game like this? Another aspect of the distance that I like is that it (theoretically) helps players keep cards longer. Since each player only draws two cards per turn, the Sheriff wouldn't last very long if everybody could target him. After all, if each player shot at the Sheriff, then he would quickly run out of "Missed" cards. Fortunately, the distance mediates some of this by preventing everyone from being able to target a single player at the same time (unless they have guns and such). The final pro that is worth mentioning in Bang! is the replayability. Because of the large number of playable characters (16 if I recall correctly) each with a different ability, and the constantly shifting roles, the game can be played repeatedly without feeling the same. One con in Bang! that is pretty common among card games is the luck "of the draw" (yes, that was a pun in case you missed it. It's a Wild West game... "of the draw" - you're welcome. Anyway...) Depending on what you draw, you may or may not be able to shoot your opponents. You also may or may not be able to defend yourself. This really happens in all card games, but it can still be a bit disheartening to see the Sheriff at only one hitpoint and not draw a "Bang!" card to shoot at him. Overall, I give Bang! an 8.0/10. This is one of the better little card games that I have played. I can see myself playing Bang! fairly often, as long as I have a decent sized group to play with. Dodge City does not really change the core of Bang! very much. The main additions to the game are 1) new playable characters, 2) the ability to play with 3 or 8 players, and 3) new "green bordered" cards that can be put in front of you on your turn, but can't be used on the turn that they are placed. I really like the new characters in Dodge City. They really did a good job of finding new abilities to give to characters. One example is a character that is able to ignore all cards with "diamonds" on them that opponents play at him. These new characters help prevent the game from becoming stale, and so they are a definite pro. The ability to play with 3-8 characters is good. As often as I have played Bang!, however, I have never wound up with 3 or 8, so I cannot say for certain how the game holds up with these numbers. 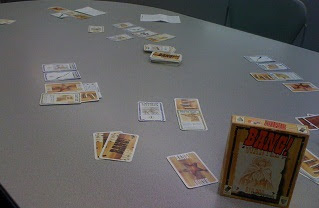 Having read the 3-player rules, I will admit that I would probably play something else before playing Bang! 3 player. Essentially, one player is an Outlaw, one is a Renegade, and one is a Deputy. You each have one specific character that you have to kill, and if you kill the wrong person, then the game keeps going. So, in my opinion 8-player is a pro, 3-player is a neutral. The "Green Bordered" cards are interesting, but are really only useful at helping a player stay under his hand limit. I haven't played any games where that really became a major factor, and so it is more annoying that you can't play the card immediately than it is beneficial. Because of this, I consider it a neutral point to the game. Overall, I give Dodge City an 8.0/10. Since I own it, I will keep playing with it - after all, I am glad to have the extra characters. Once you have played Bang! enough that you are tired of the same characters, or if you have 8 people in your gaming group, you should definitely check it out. If you only play Bang! every now and then, Dodge City will probably not be worth your time. If you want to know what some of my fellow reviewers think of Bang!, you can see a Bang! review on I Slay the Dragon, or another Bang! review from the Board Game Family. Or, of course, you can check out more of my reviews - like Gloom, King of Tokyo, and Samurai Sword (which is based on the Bang! system). I must say, I still prefer the wedgies and roundhouse kicks of Lunchmoney. Josh, I liked your concise review. I think Dodge City and the green-bordered cards are a little better than you give them credit. Especially regarding the defensive green-bordered cards, since you do not have to wait a full round for them to be activated. The moment your turn is over and someone shoots at you, you can use them. That makes them immensely useful, and helps you adjust what you keep in your hand. If you have time, I recommend checking out Death Mesa, an unofficial expansion to BANG! that deals with the issue of player elimination. Dead players remain in the game as ghosts, less powerful than the living players, but still able to influence the game and win in their roles. This expansion can be ordered online or simply downloaded and printed out. Check it out at the BANG! Blog if you are interested. That site also has a useful collection of character guides for both the original BANG! and Dodge City characters, which gives general strategies on how to maximize their abilities. Josh is a member of the Amazon Associates program. This means if you buy stuff on Amazon from the following link, you are supporting the site! 9-10: Awesome game! Every gamer should play this! 7-8: Game is playable and fun. Not to be overplayed. 1-5: I'm sorry you wasted your time. This game is just broken. A friend of mine has observed to me that my rating system is very similar to a grade from school. I liked his point and so I figured I'd mention it here. It may make it easier for you to think of 9-10 as an "A", 8-9 as a "B", etc. After all, if you have an "F", does it really matter how bad your "F" is? All games titles and art included in images are copyrighted by their respective owners. Powered by Blogger.